Democratic President Barack Obama expressed support for the UK remaining in the EU last month. 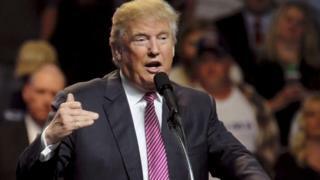 Mr Trump, who has emerged as the Republican presumptive nominee for the US presidency, told Fox News: "I think the migration has been a horrible thing for Europe, a lot of that was pushed by the EU. "I would say [the UK] are better off without [the EU], personally, but I'm not making that as a recommendation, just my feeling. "I know Great Britain very well, I know the country very well, I have a lot of investments there." He added: "I want them to make their own decision." In April, Mr Obama said Britain would go to the "back of the queue" for trade deals with the US if it votes to leave the European Union, sparking anger among Leave campaigners in the UK. Mr Trump has a number of business interests in the UK and is the owner of the Turnberry golf course in South Ayrshire, as well as Trump International Golf Links near Aberdeen. In December he caused controversy after calling for a temporary ban on Muslims entering the US which fuelled a debate over whether he should be allowed entry to the UK. More than half a million people backed a petition calling for the billionaire property tycoon to be barred for his comments, triggering a debate in the Commons. At the time, Prime Minister David Cameron said the comments were "divisive, stupid and wrong", and on Thursday he said his view had not changed but added the presidential hopeful deserved respect. Mr Cameron said: "Knowing the gruelling nature of the primaries, what you have to go through to go on and represent your party in a general election - anyone who makes it through that deserves our respect". But he added: "What I said about Muslims, I wouldn't change that view. I'm very clear that the policy idea that was put forward was wrong, it is wrong, and it will remain wrong."